Although the air still hangs crisp with winter, seed sowing season is nearly upon us – that time of year when the window sills of the industrious are stocked with small, peat lined plastic containers. With careful gifts of water and radiant window light, small seeds will crack open and send vivid green shoots through the black, crumbling soil, into the glow. In a few months time, these brave seedlings will make their way outdoors, into the deep, hot sunshine, where they will mature into edible gardens. Food for our souls. Today, we’re imagining ourselves in this garden, though winter is still upon us. 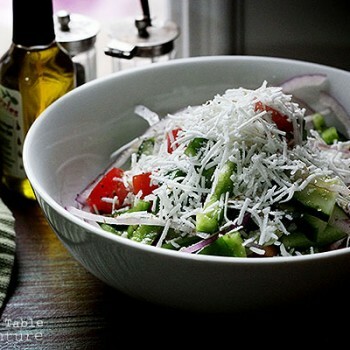 And we’re doing it by nibbling upon a Serbian Salad. This isn’t a recipe, so much as a guide to freshness. 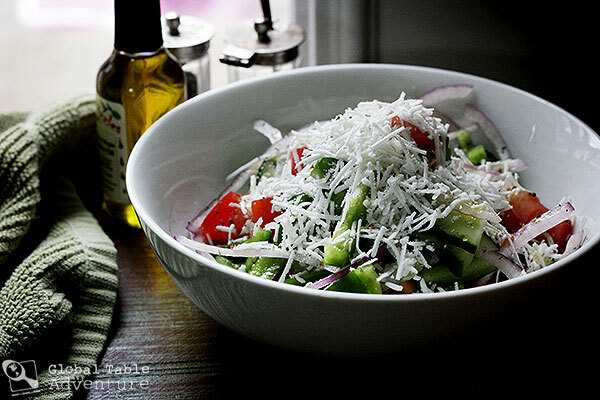 The key to a beautiful Serbian salad is simplicity – cucumbers, tomatoes, and peppers, topped with oil and vinegar… and especially cheese. 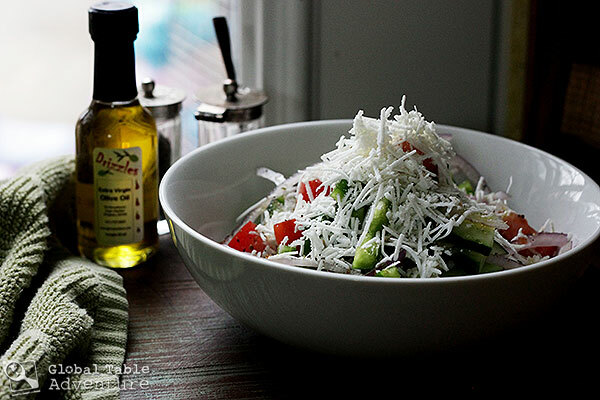 You want to grate the cheese over the top until your salad looks like a snow-capped mountain. 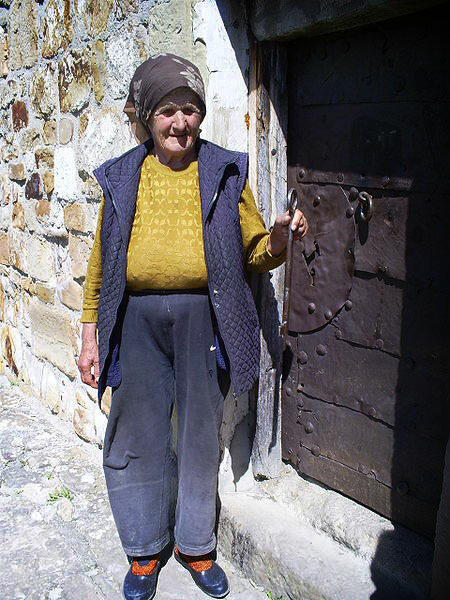 Grandma Jovanka, guardian of Petrova church. Photo by Jovanvb. With the usual addition of thinly sliced onion and a snowfall of grated cheese. 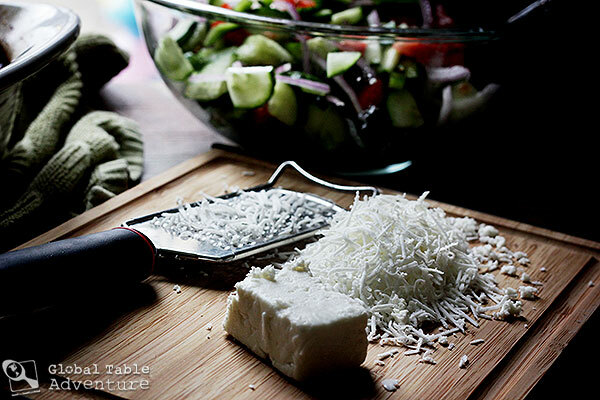 I grated a goat feta, but you could use any sort you desire. For a finishing touch, drizzle it with olive oil, vinegar, salt, and pepper. Enjoy this loveliness on a sun-filled day, with dreams of the deep, joyful summer to come. 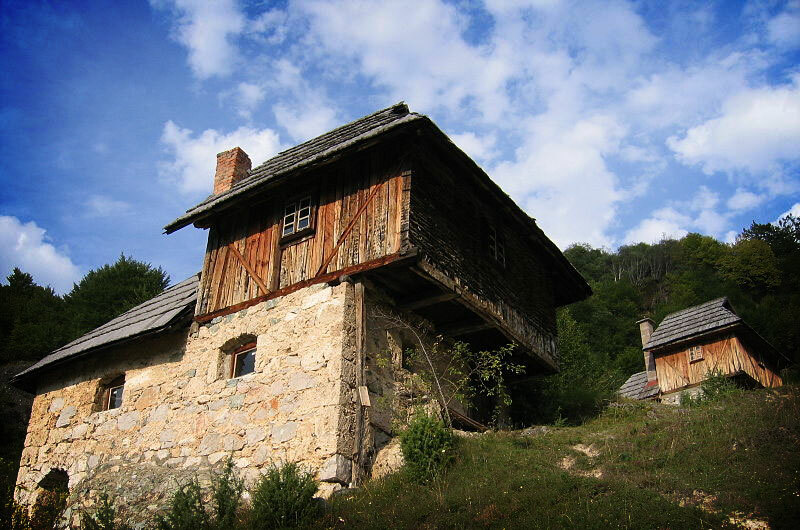 Old mills on waterfall Sopotnica, Jadovnik mountain, Serbia. Photo by Goran Anđelić. Although the air still hangs crisp with winter, seed sowing season is nearly upon us – that time of year when the window sills of the industrious are stocked with small, peat lined plastic containers. With careful gifts of water and radiant window light, small seeds will crack open and send vivid green shoots through the black, crumbling soil, into the glow. In a few months time, these brave seedlings will make their way outdoors, into the deep, hot sunshine, where they will mature into edible gardens. Food for our souls. Today, we’re imagining ourselves in this garden, though winter is still upon us. 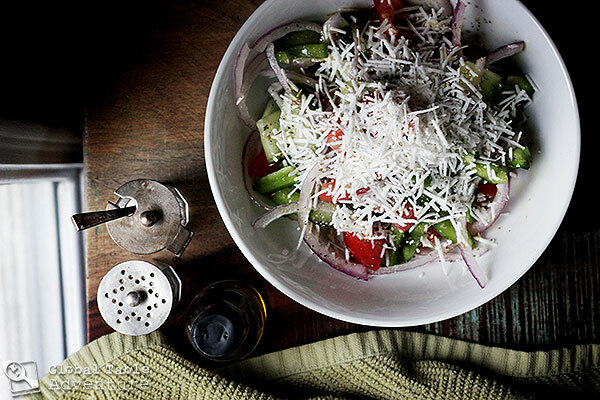 And we’re doing it by nibbling upon a Serbian Salad. 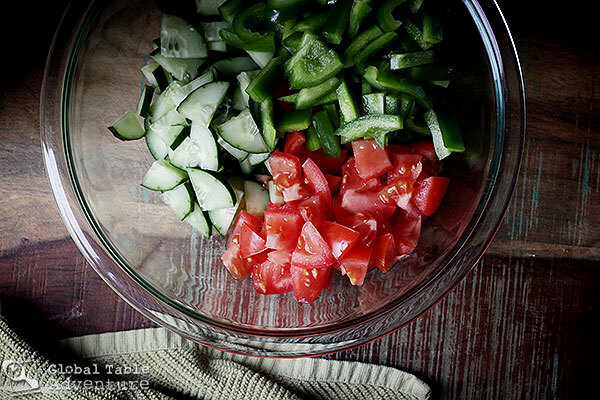 Toss all salad ingredients together. Drizzle with vinegar, oil, seasoning. Can’t wait for “tomato season” to be able to make dishes like this with proper ingredients! Thank you for the recipe.